I really enjoyed this book! It is a cute and fast paced well written contemporary and the characters were lovely to read about. In particular – Josh. I now have a slight crush on him! I also really enjoyed the settings going from New York to Paris to Barcelona. I adore New York and it made me feel like I was back there, again. I also enjoyed catching up with Anna and Lola and where they are now and what they’re doing! The only problems I had with the book really was the major event that happens (don’t want to spoil!) didn’t feel very major or plot twisty. I mean, I was surprised it happened but it happened so quickly and was over very quickly? I feel like the author maybe could’ve dragged it out a bit more but I could see why she probably didn’t want to, in case of turning the reader off. 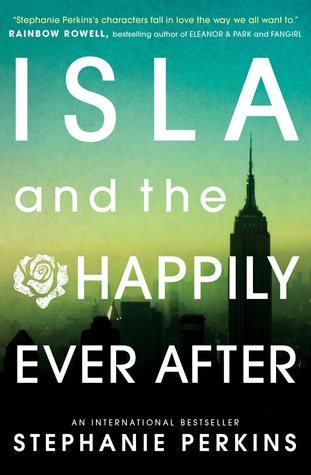 I didn’t feel like this book was as good as Anna but I do feel Isla is a step up from Lola. I would highly recommend the series overall if you are looking for a cute, fast paced, YA contemporary series to cuddle up with! Next Next post: Christmas Cracker Tag!